Bundle any combination of six of our live webinar sessions to elevate your team’s knowledge of disability inclusion quickly and easily. Topics range from recruiting and hiring, to onboarding and accommodations, as well as creating a more inclusive environment. Choose from all of our webinar titles, including: Interviewing and Positioning Individuals with Disabilities for Recruiters, Interviewing and Onboarding Individuals with Disabilities for Hiring Managers, Etiquette 101 for Customers, Employees and Co-Workers, The Accommodation Process, Tax Credits and Other Incentives, and OFCCP, ADA and EEOC and Disability. All of our live webinars are led by HirePotential’s founder and recognized disability expert Sheridan Walker. Each session is designed for smaller groups of up to 25 participants and can be selected more than once as part of your six to accommodate larger organizations. Don’t wait around until the next scheduled training. 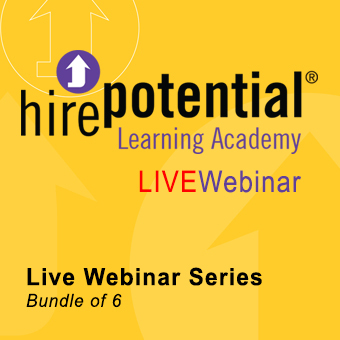 Partner with HirePotential to train your team on a schedule that works for you with one of our engaging webinars today.